A reader/listener requested some music by Mbaraka Mwinshehe, and I'm more than happy to oblige! Mwinshehe was the great Tanzanian guitarist and vocalist who thrilled East African audiences from 1965 to 1979 with the famous Morogoro Jazz Band and then with his own Orchestra Super Volcano. He tragically perished in an auto accident in January 1979. Mbaraka became known to many outside of Tanzania and Kenya in 2000 with the release of Mbaraka Mwinshehe & the Morogoro Jazz Band: Masimango (Dizim 4702-2). Polydor Kenya had previously released at least ten volumes of Ukumbusho (or "remembrance"). This LP series gathered together many of the singles and LP cuts that Mwinshehe made over the course of his career. Unfortunately, the Ukumbusho volumes do not provide information on the individual recordings and seem to jumble together tracks from various points in Mwinshehe's career. Of the five songs featured in this post, "Daktari ni Mimi" (from Ukumbusho Vol. 3 [Polydor POLP 542], 1983) and "Mama Chakula Bora" (from Ukumbusho Vol. 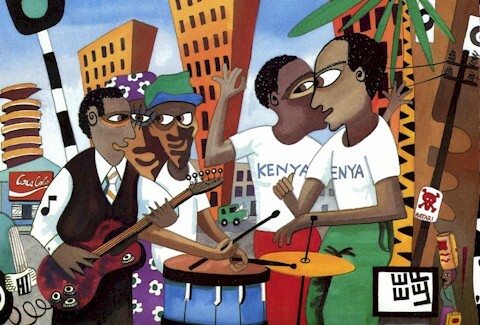 4 [Polydor POLP 550], 1985) were apparently recorded with Morogoro Jazz, while "Vijana wa Afrika," "Jasinta" and "Mtaa wa Saba" (all from Ukumbusho Vol. 2 [Polydor POLP 537], 1983) were probably made with Super Volcano. Several months ago our friend Zim Bida was kind enough to send me rips of almost all of the Ukumbusho volumes that I don't have. Would you believe that I haven't even had time to listen to them all yet? Rest assured that I plan on posting more of this great music in the future!